3 bedroom, 3 and 1/2 baths, sleeps 6 Tropical Feel with a Luxury Touch The Villages Mauna Lani 510 feels like a large luxury home. It is located only a short walk on the same street as the pool area and recreational center, with large work out room , conference room and kitchen. Plenty of lounge chairs around the pool to hang in and enjoy your Hawaiian days of relaxing, swimming, snorkeling , walking , or just sitting on the lounge chairs provided. Master Bedroom with Full Bathroom including separate shower and soaking tub has King Size Bed, walk in closet with it's own private lanai for enjoying the morning or as twilight starts to arrive. 2nd Bedroom is upstairs at the other side of the hall includes a small work area as well as two full size beds and a private bathroom with a shower. The 3rd Bedroom on the lower level has it's own private bathroom and offers a Queen Size Bed. This tropical oasis is a wonderful place to spend a family vacation. 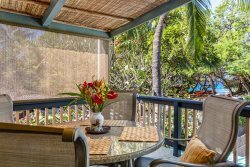 Located in the Mauna Lani Resort area, the Villages are conveniently located near the town center of Mauna Lani. Almost all the activities, restaurants, stores, and amenities at the Resort can be accessed using the links to the The Shops at Mauna Lani, the Mauna Lani Resort, and the Fairmont Orchid Resort provided below. Additional resort specific information follows the links.